Running a great customer success practice can be challenging in a high growth environment. And when you expand to multiple time zones, countries, and continents, it increases the complexity. Your customers expect to see value in your company everyday. Over time, we learned from our experience and created an organization that is driven to build relationships that create tremendous value for our customers. We’ve scaled our customer success practice to serve 4,000+ customers in over 100 countries and counting. Today, we share some customer success best practices that created organizational differentiators for CleverTap and drove long-term customer relationships. Let’s start by looking at the difficulties of running a SaaS customer success team on a global scale. When we started CleverTap, we worked with companies in US and Asia, and our customer success team handled both sales and service. It reduced our overhead, but it also took our team’s time away from selling. This led to longer sales cycles and conflict during the selling process, since the same person was solving the issue and trying to cross-sell and up-sell. We made sure that the Customer Success team was focused on serving the customer (no more selling). As we expanded our customer base, we had to address some challenges along the way. Customers are willing to wait for customer service—but not for very long. In fact, they expect a response within an hour. When the average customer service response time is over 12 hours, being quicker to respond is a great way to stand out from the competition. Customer success reps can’t solve every customer’s problems. Many a times a software engineer needs to get involved. Reps need to have a system in place to get engineers the information they need to start working on the problem. Ensuring the right tools and process is very important here. 62% of companies don’t respond to customer emails. Without transparency and accountability, that number isn’t going to improve. Coordinating worldwide customer success teams and clients makes that especially difficult. Getting a system in place right away is crucial, but it’s not always a priority for expanding businesses. That’s a big mistake that we knew we couldn’t afford to make. Customer success reps are often the first people who learn about issues customers are facing, and their input can be invaluable in influencing the product roadmap. They can convey to the rest of the team what customers really need and will appreciate. Making sure that feedback gets to where it needs to be is tough. It’s easy to lose that information in email chains. And when the problem does get solved, customer success representatives need to be aware and proactively pass that information to the customer. Here’s a short roadmap that we created, based on our experience in scaling our own customer success team. It contains all the tasks we found helpful in our own scaling process. This is the most important thing you can do when scaling your customer success teams. Everyone at CleverTap understands that customers’ success is top priority. It is a Top down, company wide commitment. Each new employee in every department has to spend two weeks in customer success so they understand what it’s like to be on the front lines of the company. They understand that their actions have a direct impact on our customer success reps, and they understand what that means. But don’t just tell them—show them, too. Your executives should be visibly involved in customer success initiatives. Even better is to get them involved in day-to-day customer success activities. Peter Strebel, the chief marketing officer of Omni Hotels, actually answers customer emails. His goal is the same as any rep: ensure that the customer has a better experience. If your employees see that the whole company, starting at the top, is committed to customer success, they’ll get on board. GrooveHQ has a great article on how to create a culture of customer success that fits your business. We recommend starting there. There are three things that we look for in our employees to ensure that they’re able to deliver the ultimate customer service experience: empathy, cultural fit, and product knowledge. Product knowledge can be learned. Cultural fit can’t be learned, but it can be cultivated to some degree. Empathy, however, needs to be with a person from the beginning. Not sure how to hire empathetic employees? Try these interview questions. They’ll give you a better idea of how a potential employee might fit into your customer success flow. Issue tracking, communication, and analytics tools help our team keep track of customer success issues and resolve them as efficiently as possible. We used Freshdesk to start and accelerate our customer success organization. Choosing the right software for your company depends on your exact needs, so do some research to find out which solutions will work for you. We then chose a platform which works both for our Engineering team as well as our Customer Success team. Just remember that customer success goes far beyond using the right tools. We mentioned the metrics we use—but these might not work for your company or product. Monthly recurring revenue is a safe bet for almost every company, but you’ll have a better grip on your customer success performance if you choose metrics that make sense for your company. It might be hard, but we recommend making these metrics public, too. At least to your product, marketing and sales teams. Everyone should know when your company is doing well or when they need to work on their customer success skills. It doesn’t need to be a competition. But it’s very motivating and helps keep the focus on success. Pretty much everything in the SaaS world comes down to MRR. 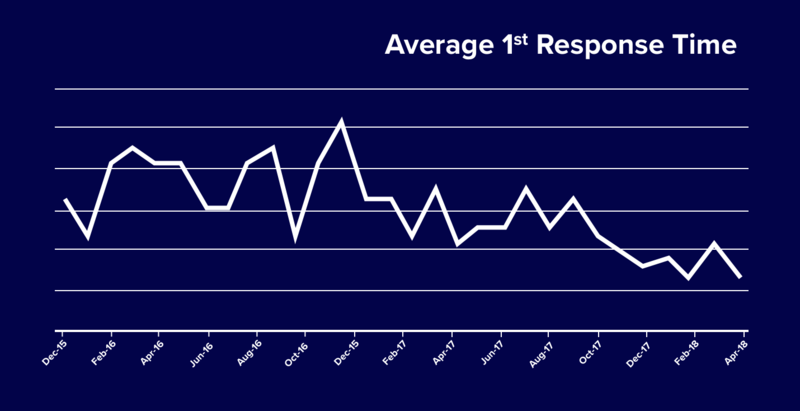 If your MRR is going up, you’re doing something right. It’s not quite that simple, but in general, your MRR shows the health of your business. If it’s on the rise, you’re doing well. If it’s going down, you need to change something. And while customer success might not seem to have a direct effect on MRR, it can have a significant effect on churn. Churn is another critical factor you should consider alongside MRR. Customer churn is the percentage of your customers that unsubscribe every month. We think MRR churn is a better metric, because it recognizes customers provide different amounts of revenue each month. Customer success has a big impact on MRR churn. Providing good success improves the customer experience. And a positive experience will reduce MRR churn. In simpler words, it is the average time taken by our support team to response to a ticket raised. Efficient communication is the cornerstone of any support team and we make sure that we improve on the metric and decrease the time to first response with every new ticket raised. The following graph and the downward slope is a testament to our efforts in the direction. Average resolution time = Total time taken to resolve tickets during the selected time period divided by the number of tickets resolved in the selected time period. 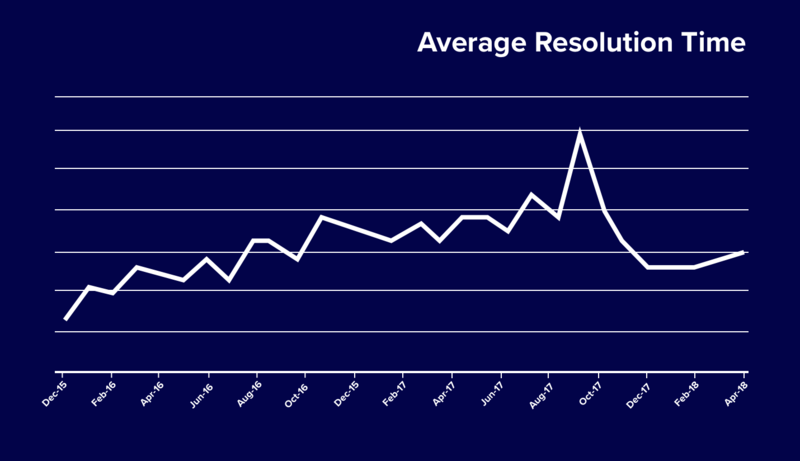 Average resolution time is another defining metric for support teams and processes globally. We strive to resolve tickets with complete customer satisfaction and in a timely manner. The measure of average resolution time helps us keep a close watch on our TAT and helps us introduce or improve on processes to be more efficient. Some companies run trainings for their customer success reps. But the best companies train everyone in customer success. Salespeople, marketers, account managers, developers, and everyone else in the company should know how to provide great customer experiences. Zappos, legendary for their customer service, starts training employees as soon as they’re hired. That’s the kind of training model that will help boost your business. But don’t stop there. Keep customer service training going with regular updates, workshops, and new ideas. No company can succeed without good communication. This is even more true when it comes to scaling your customer success. One of the most important parts of our customer success is making sure that customer feedback gets to developers quickly when they’re needed. That’s central to our customer’s success, so we put systems in place that make it happen. Your company will have different challenges, so that might not be a priority for you. Whatever your priorities are, make sure that scalable systems and processes are in place to support it. Before you start scaling, think about potential communication challenges that you’ll face. Then brainstorm solutions that you can put in place before problems crop up. Good documentation goes a long way. It is an important step in helping your employees internalize your customer success process. Using a content distribution system can help in making your documentation available and easily searchable to your employees. The quicker it is for them to find the information they need, the easier it will be for them to learn it and put it into practice. If creating an global customer success team is so difficult, why did we spend the time and money to do it? When it comes to improving customer service, many people focus on tools. They try to find the right software, the right mobile apps, and the right communication services that let them deliver the best customer service possible. Choosing the right tools is important. If you’re not able to respond quickly because you’re using an outdated email system, for example, your revenue will suffer. So it is important to choose the right tools. We use JIRA for our customer relations management. We also use Confluence for collaboration. Both apps helps us track the things we need to stay on top of, like support tickets, feature requests, and marketing materials. But that’s not what makes for great customer service. Effective customer success starts at the top of the organization. Executives need to emphasize customer success. For example, all of our reps know that we expect them to respond to queries within 24 hours. We also consistently update all of our support documents so we can solve future issues faster. A culture of customer success motivates people to take the extra step. And that extra step makes the customer journey more positive. That’s the cornerstone of customer success. You can teach technical skills, but none can replace the drive to improve the customer experience. Instilling that desire will get you further than any customer service tool. Trust is the most powerful currency in business. If customers trust your brand, they’ll be more loyal, more likely to spend money, and better brand ambassadors. All of that is built on good customer service. We strongly believe that no brand is better than a negative brand. So when you engage with a customer – how big or small – make sure you treat them with respect and create a sense of trust. We also recognize the value of customer success for cross- and upselling customers. Interactions with customer service aren’t always just about forgetting passwords or not being able to find the right button in an app or about integration challenges. They’re often about solving problems, and when our customer success managers can solve our customers’ problems, there’s opportunity there. Our agents know that cross- and upselling is a high priority for us, and we provide the skills and tools they need to get it done. We work closely with out customers and understand their roadmap and suggest use cases that can help them do a better job at email marketing. Here is an example of how we built an event strategy for a travel customer around app awareness and acquisition. Customer service also helps us create a “sticky” product. Consumers are willing to pay more for the same product if customer service is better—and that continues even when competitors release a new product or change their pricing structure. The more peripheral use cases you find or the more closely you follow your customer’s growth trajectory, the more likely you are able to suggest solutions that add to your core product. Once they keep seeing value in the product and you manage the time to value, you and your customer or a great path to success. The customer success team works with real customers with real problems. We triage our customer issues in various buckets and add those to our engineering sprint every 2 weeks based on enhancements or new features. Certain suggestions might arise from one customer but the entire community ends up benefiting from it. All of this puts us in a position to better meet customers’ needs than our competition. The agility with which the success, engineering and product teams work to solve our customer challenges is remarkable. And, of course, we love our customers! We emphasize customer success because we truly believe in the customer-first philosophy. They’re collaborators in our company, and we build strong relationships with them. It only makes sense that we take good care of them! Providing great customer service benefits every part of our company. We develop honest relationships with customers, make ourselves available to serve them, get recommendations from them, enable them to be our evangelists and improve our product so they’re more committed to using it. We knew this going in, and when our customer base started expanding beyond borders, we knew we had to get the right people-culture fit in place to make sure that we could provide service for organizations in over 100 countries. We remain committed to continuously build long-term value for our customers while we grow and scale our organization.